Dr.Malpani's Blog: Laparoscopy and IVF - before, after or never ? 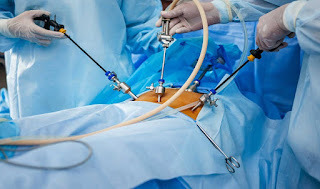 Before referring a patient for IVF to an IVF clinic, many gynecologists will insist on doing a laparoscopy . They justify this using all kinds of pretexts. saying" We will get a chance to check your pelvis, so we can clip your tubes, if needed, or burn any endometriosis." Their justification is that doing this will improve the patient's chance of getting pregnant with IVF. This is false, but poor patients don't know any better. They feel that if they are going to spend so much money on IVF, they might as well spend a little bit more on the laparoscopy, if this will improve their IVF success rate ! Removing small fibroids and cysts is pointless, and does not affect IVF treatment, which is why they are best left alone ! In fact, a lot of IVF doctors will also refer their patients back to their gynecologists for a laparoscopy , because they follow a "You scratch my back and I'll scratch yours" model - " If you send patients to me for IVF , then I will send them back to you for a laparoscopy so that both of us are happy." Of course, the poor patient is the only one who is a loser in this entire business. This is why it's important that patients need to learn to speak up and ask, " How is the laparoscopy going to change anything?" Obviously , if it doesn't, then please say No ! There's no such thing as a minor procedure or minimally invasive surgery - any surgical procedure carries risks. In fact, a laparoscopy can reduce your chances of getting pregnant with IVF, because overenthusiastic surgeons can reduce your ovarian reserve while cauterizing endometriosis ! Lots of gynecologists also want to do laparoscopies for patients who have failed an IVF cycle, saying, " If we do a laparoscopy we'll be able to figure out what the reason for the failure is." Again, this is just not true, but unfortunately patients aren't assertive, and they're not well informed enough to be able to ask intelligent questions. Sometimes they agree, simply because they are so desperate because their IVF cycle has failed. They agree with anything their doctor says, without realizing that it's not going to help them - it just causes them to waste their money.